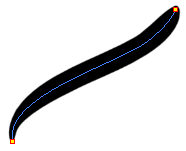 The Size parameter lets you set the size of the polyline that you will draw. Harmony provides a variety of thickness stencils and also lets you create and save your own. 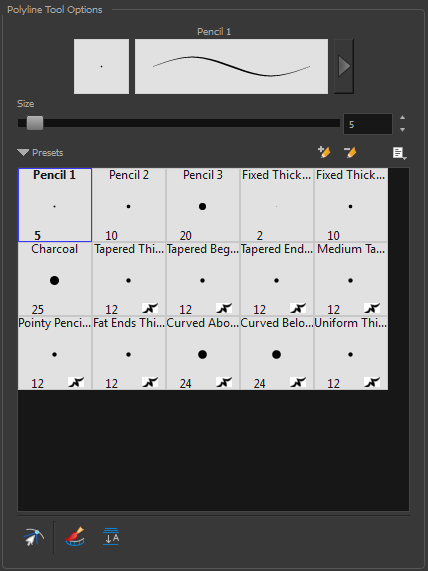 It is a good idea to create and save pencils with precise sizes and parameters when you draw and design. A thickness stencil saves a preset of how the thickness information looks across the length of the line. When drawing with a thickness stencil, the pressure sensitivity of the tablet is discarded in order to apply the thickness stencil. A thickness stencil can be used while drawing, or applied afterwards. As you draw in the Line Art layer, the Create Colour Art Automatically option automatically creates the corresponding strokes in the Colour Art layer. To access this option, you must be in the Advanced Art mode.